Claytonia.virginica.M. B. Gargiullo (ca 2010). Claytonia virginica is a perennial, spring ephemeral herb; about 10 cm tall from a corm (storage root) about 3 cm thick, bearing several flowering stems, colonial by vegetative reproduction of corms. Leaves linear, stalkless, fleshy, dying back by late May; a single vegetative leaf and two basal leaves on each flowering stem. Claytonia virginica.Mike Feller. Pelham Bay Park, NYC. 4/2017 (Accessed 5/2017). Flowers pinkish-white, 5 petals; contains nectar, pollinated by bees (Hymenoptera) including: Andrena erigeniae, A. carlini, A. masonii. (Andrenidae), Nomada luteola (Cuckoo bees, Anthophoridae), honeybees, Apis mellifera (Apidae), Dialictus sp. (Halictidae), and flies (Diptera) including the bee fly, Bombylius major, (Bombyliidae), and Syrphid flies including; Metasyrphus americanus, Eristalis dimidiatus and Helophilus fasciatus (Borrer and White 1970; Schemske 1977; Bierzychudek 1982; Campbell 1985; Motten 1986), listed as self-compatible but requiring insect pollination by (Schemske et al. 1978) and (Schemske 1977), blooms in April, flowering ends before canopy closure; plants dormant by mid-late June. 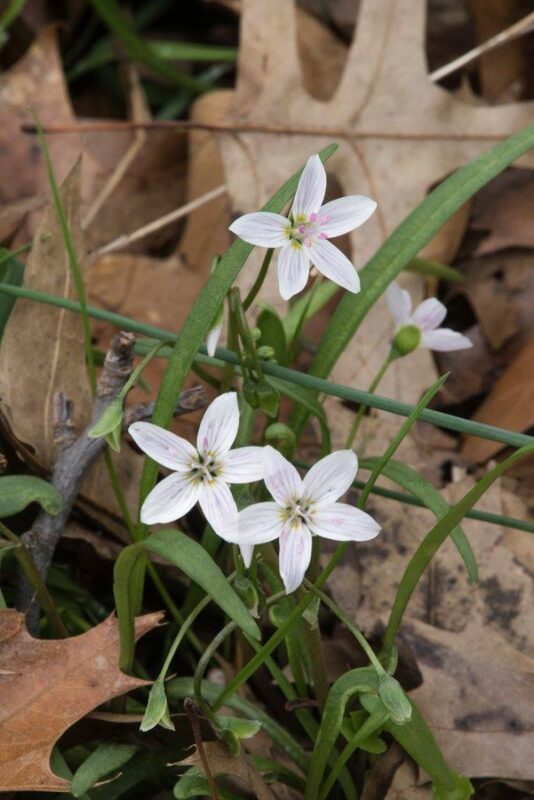 Claytonia virginica.Steven Baskauf. Copyright © 2015 CC-BY-NC-SA. 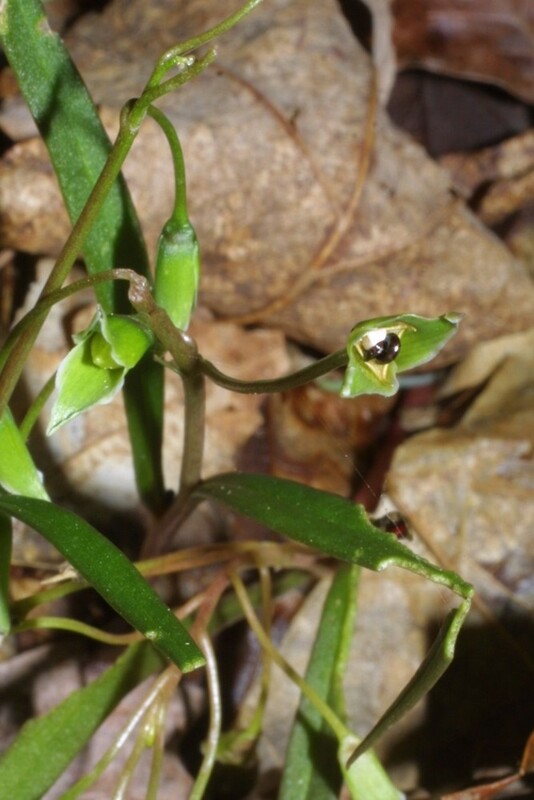 Bioimages – www.cas.vanderbilt.edu:bioimages:frame.New England Wild flower Society.gobotany.newenglandwild.org (Accessed 2/2015). Fruit dry, a capsule with several shiny black seeds each bearing a fatty appendage (elaiosome), fruit maturing within 10 days, seeds initially dispersed by explosive dehiscence of capsule, secondarily dispersed by ants attracted to elaiosome, probably including genera: Aphaenogaster (A. rudis), Myrmica, Formica and Lasius (Beattie and Culver 1981; Handel et al. 1981; Thompson 1980; Schemske 1977). Seeds eaten by mice. 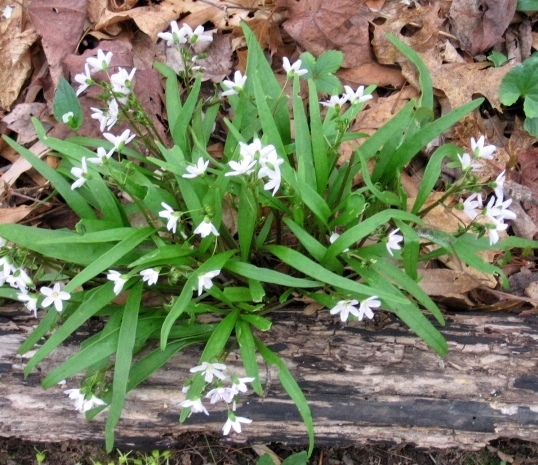 Habitat: Understory of moist forests, sometimes in lawns and hedgerows. Found in soil pH 6 (Gargiullo unpublished data). Notes: Requires high light levels in early spring before canopy closure (Eickmeier and Schussler, 1993). Reproductive period is limited by lowest temperatures that pollinators can be active (ca 13 °C) and by tree canopy closure restricting photosynthesis (Schemske 1977). Roots and shoots begin to redevelop in fall after 90-120 days of dormancy. Cold stops further growth until spring (Risser and Cottam 1967) Spring ephemerals take up soil nutrients, especially N, in early spring. Some nutrients are sequestered in bulbs or roots but some are released back into soil when leaves and flowers decompose, just as tree and summer herbs are expanding their leaves (Peterson and Rolf 1982). Dispersal to and establishment in new sites in successional forest, contiguous to old regrowth stands has been calculated at a rate of 1.14 m/yr (Matlack 1994). The closely related species, C. caroliniana, requires at least 1.8% sunlight in order to survive (compensation point), but cannot use more than 15% full sunlight (saturation point) (Hicks and Chabot 1985).